The Verdict Is In - Guilty! Continued Story from last week’s Blog Post. I would have done anything to sit in on Mr. Richardson’s trial. While court was in session, I sat in class unable to focus on that day’s arithmetic problems. I imagined Mr. Richardson sitting, handcuffed in the courtroom, listening to his defense lawyers make all sorts of arguments on his behalf. Several townsfolk attended the trial. Each day after school some of our neighbors would stop by our house to relay that day's court events to my parents. We learned that Mr. Richardson was indicted for killing and murdering Mr. Fogwell. During the trial they expounded on Mr. Fogwell's gun shot wounds. 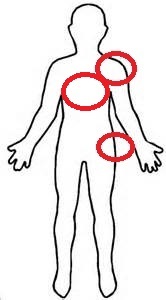 Perhaps this is what the body sketch of where Mr. Fogwell was shot looked like. The prosecution certainly could have used something like this to illustrate to the jury where Mr. Fogwell was shot. 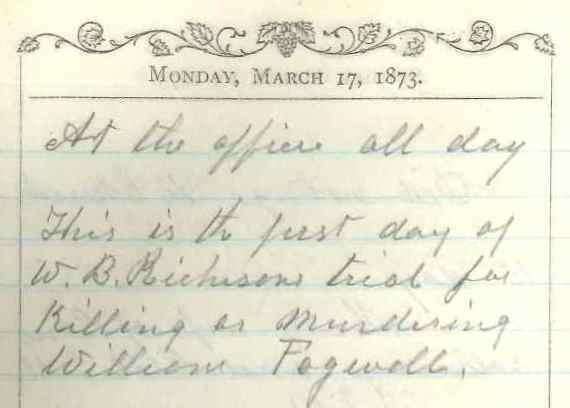 On March 26, 1873 the verdict came back and not surprisingly, Mr. Richardson was found guilty of first degree murder. The jury did not reach a verdict until 10:00 PM that night. 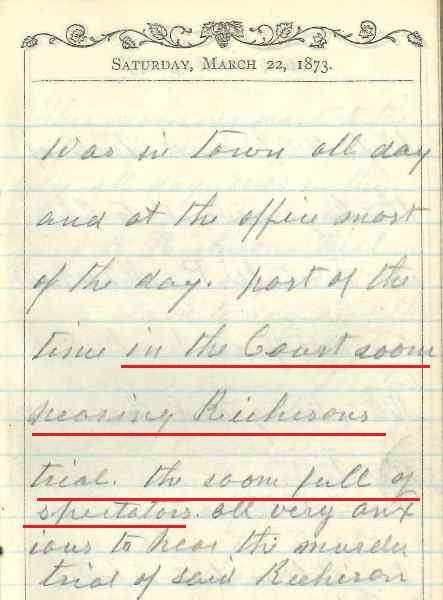 During the month of March 1873, Greene County residents were fixated on this trial. Mr. Richardson was to hang! But to everyone's surprise, he was granted a second trial on the basis of - lack of sufficient evidence, misconduct of one of the jurors, and the verdict was contrary to the law. By the summer of 1873, Mr. Richardson was found guilty of first degree murder for a second time. However, his scheming escapades would not end there. Mr. Richardson was now spending his days shackled in irons in the County jail. The Xenia Gazette reported of a botched escape carried out by Mr. Richardson. Working secretly at convenient intervals, he was able to wriggle the irons off. 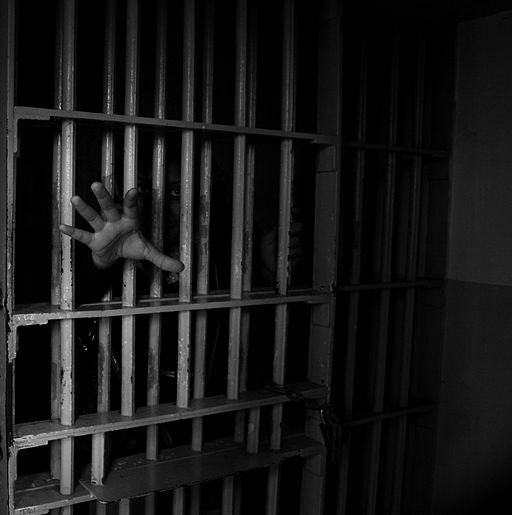 During the evening of August 15th, Deputy Kyle entered Mr. Richardson's cell and unsuspectingly, was hit by an object Mr. Richardson tightly gripped in his hand. Mr. Richardson rushed towards the ajar door but Deputy Kyle caught him. Both struggled on the floor and using all his efforts, Deputy Kyle subdued his prisoner and slammed the cell door behind him. A complete search of Mr. Richardson's cell was carried out. Hidden in a crack of the cell wall was a small saw blade. Behind this bravado, I believe Mr. Richardson knew that he would soon meet his demise. Not wanting to end his life at the hands of his captors, Mr. Richardson began to starve himself. He demanded that the Sheriff give him large quantities of food - indigestible food that would bring about his death. The Sheriff brought him no such thing. According to the Xenia Gazette, Mr. Richardson angrily began a profanity laced tirade. That evening (Saturday, August 30th), he ripped off the sheet to his cot and twisted it in order to use it as a rope. Wrapping it twice around his neck, Mr. Richardson took his own life. The following day, he was buried on his farm in Beavercreek Township. Life went back to normal after Mr. Richardson was buried, but every once in a while, I think back to that fateful night of the shooting. This Week's Trivia Question: Beavercreek Township is one of the original four townships in Greene County. What were the other three?